I did it! I finally had the chance to have a quick poke around in an op-shop this week. Chas had to tag along with me, much to his disgust (op-shopping is only for girls apparently) so i tried to get him excited by saying we were like pirates going on a treasure hunt..........he wasn't too impressed with the treasures we looked at, but i did manage to find a few. 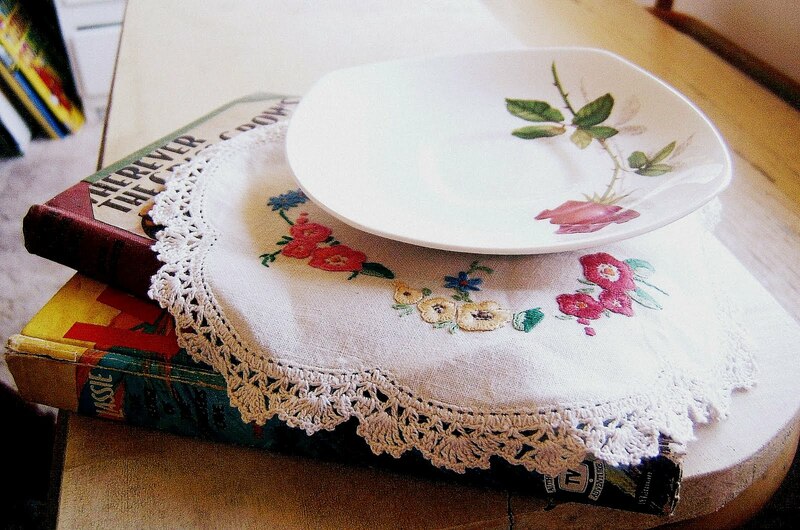 Added to my collection was another pretty little china saucer, a lovely embroidered doiley & two vintage books (one from 1942 & a classic old Lassie novel). I also found a school pinafore for Amity for $3.00, which normally value around $60 brand new, so i was pleased with that one & also Chas found the sequel to 'Gone with the Wind', 'Scarlett' - so that one definitely had to come home with us. And anything else i find that i love is a bonus! At the moment i'm really hoping to find the mirror - i desperately want one for above our bed.........i'm still searching. So what's on your list? Which sections do head to first & what item are you desperately hoping to find? Hopefully i'll get another chance to go thrifting again asap, (and with a bit of luck i'll find the mirror) i have really missed it! In the meantime i can check out Flea Market Finds & see all the goodies that i have already missed out on. That is a great list! The first thing on my wish list is vintage sheets, closely followed by craft books. Lovely finds, I would love to find a pretty mirror too! I always check for any vintage knitting or crochet books... scarves .. 70s bedlinen .. teatowels ..oh so so much. What a great list ... I hope you find them soon. I love finding kids books, tablecloths, doilies ... ahh the list goes on and on. That little doily is adorable. I like to look for dishes, linens, tabletop items, buttons, Scottie dog items, crystal. I keep my eyes open, though, and if something appeals to me (and it usually does), I'll step outside my normal list and happily pick it up also. what a lovely collection of treats! love that saucer and the doily is beautiful.